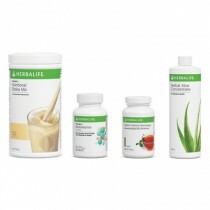 The Herbalife programmes includes delicious meal-replacement shakes that are packed with nutrients and which can be personalised with the right amount of protein your body needs to control hunger. The meal plan also allows you to eat a variety of your favourite foods, colourful fruits and vegetables, healthy carbs, lean protein and protein snacks–all of which help keep you feeling great as you lose weight. Your Independent Herbalife Distributor optimises your success with motivational support, advice on exercise, tips on healthy eating, weight-loss tracking and more! Your coach can also recommend enhancers–dietary supplements–that can help you overcome personal weight-loss challenges, such as cravings, low energy and digestive upset, making weight loss even easier. Discover the power of personalisation–personalised protein, a personalised meal plan and personal coaching–to help you get lean and stay that way, with Herbalife it is as easy as 1,2,3.